Having second thoughts? If you’re still in your 3 day cooling off period you can cool off immediately with our DIY Cooling Off kit. Or, if you haven’t bought yet, download it as an “Emergency Exit” just in case. In Victoria there are two ways a purchaser can walk away from a real estate contract immediately after having signed it. The first is by withdrawing the offer before the vendor has accepted it. 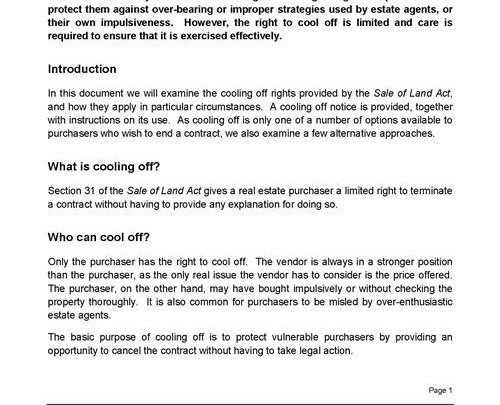 The second is by using the “cooling off” right under Section 31 of the Sale of Land Act 1962. The cooling off kit has been designed to assist real estate purchasers to cool off or to withdraw their offer quickly and legally, and to provide documentary evidence to support the cancellation. It includes a full explanation of the concepts of “withdrawal of offer” and “cooling off” written in plain English, together with an easy to use Withdrawal of Offer & Notice of Cancellation of Contract document for immediate use.